More than 30% of American adults have abused alcohol or been dependent on alcohol at some point in their lives, according to the National Council on Alcoholism and Drug Dependence. It's no wonder, then, that hospitalists frequently get calls from the emergency department about alcohol detoxification. Depending on a hospital's policies, the final determination about admission may rest on the hospitalist's shoulders, and it's not always an easy decision to make. “Some patients will clearly benefit most from outpatient treatment, while others are so far into withdrawal that it's obvious they need to be admitted. But it's the cases in the middle that are difficult and require a collaborative effort among emergency department physicians and hospitalists, keeping in mind safety and quality of care,” said Anil A. Thomas, MD, clinical director in the Division of Alcohol and Drug Abuse and unit chief of the Detoxification Clinical Service at Bellevue Hospital Center in New York City. Protocols may also help physicians present a united front to the patient or family, Dr. Kronenberger added. “Sometimes the emergency physician will call the hospitalist because the family or patient is being demanding [without the patient meeting the criteria for admission]. Having a written protocol sets some ground rules,” she said. This can be particularly important for smaller hospitals with fewer beds and limited resources. “If we admitted everyone who came in requesting detox, we'd have a problem,” Dr. Kronenberger said. Yet for all the benefits a protocol can provide, there is a dearth of guidelines specifically designed to help hospitalists decide whether to admit a patient for detoxfication. The most common alcohol assessment, the Clinical Institute Withdrawal Assessment of Alcohol (CIWA) scale, provides a snapshot of withdrawal symptoms, but it was developed with young, otherwise healthy patients in mind and does not account for comorbidities or frailty. Hospitals with mental health experts and ready access to both inpatient and outpatient addiction programs, such as Bellevue, have the resources to develop their own protocols for decision making, but smaller and community hospitals often do not. Clinicians at the University of North Carolina (UNC) School of Medicine may have a solution: They have developed a protocol to standardize care for patients who come to their emergency department requesting alcohol detoxification, and the entire protocol is summed up in a 1-page flow chart. 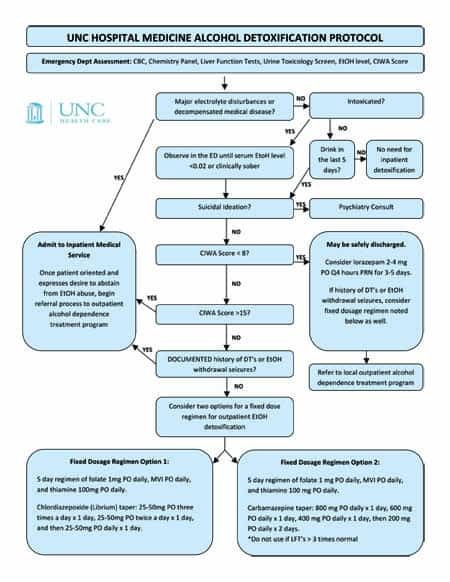 The team published the protocol and related research in the April 2014 Journal of General Internal Medicine, and the flow chart is available through the UNC website (see sidebar) . “When we did a literature search, we found only one paper that described a protocol for evaluating patients for alcohol detoxification [published in the July 2004 Journal of Family Practice] and one study that directly compared inpatient to outpatient treatment for alcohol detoxification [published in the New England Journal of Medicine in 1989]; the New England Journal study used an outpatient program that was pretty intensive and not available in many institutions, including ours,” said John R. Stephens, MD, associate professor of hospital medicine. He noted that while the UNC protocol is grounded in evidence, it was also prompted by clinicians' experiences with many potential detox admissions and readmissions. The UNC protocol accounts for the patient's current physical and psychiatric condition, level of intoxication, and history of alcohol use or withdrawal. Emergency department physicians perform the initial evaluation and consult hospitalists if they feel a patient should be admitted. “We decided to involve the emergency department because that is where the referrals come through, and we wanted them to use the protocol as well,” said Dr. Stephens. In the 21 months after protocol implementation, the team found that the number of alcohol-related admissions dropped from an average of 18.9 per month to an average of 15.9 per month. The average length of stay was slightly higher, at 3.4 days versus 2.7 days before implementation, which the researchers did not consider statistically significant. There was no change in readmission rate. Whether hospitalists adopt an existing protocol, such as UNC's, or develop their own to meet their hospital's needs and make the best use of available resources, experts agree that it should have several core elements. Alcohol-related history. Assessment should begin with the patient's history, particularly with respect to alcohol, said Reid Finlayson, MD, medical director of the Vanderbilt Comprehensive Assessment Program and associate professor of clinical psychiatry at the Vanderbilt University School of Medicine in Nashville. The UNC protocol notes that if a patient has a documented history of DTs or seizures related to alcohol withdrawal and is having at least moderate withdrawal (CIWA score ≥8) the patient should be admitted, but could be discharged if having minimal symptoms (CIWA score >8). Clinical findings. The patient's current symptoms and vital statistics are intrinsic to a decision to admit, said James B. Franko, MD, FACP, from the Carilion Clinic in Roanoke, Va. Lab work. The UNC protocol calls for complete blood count, chemistry panel, liver function tests, urine toxicology screens, and blood alcohol level. Major electrolyte disturbances require admission. Conditions that favor admission include liver disease, acute pancreatitis, congestive heart failure, heart arrhythmias, aspiration pneumonia, and uncontrolled hypertension because of the risk of stroke or heart attack, Dr. Thomas said. Also, “if the patient is vomiting blood, has stomach ulcers, or if there is anything rupturing, that calls for immediate admittance. Remember bleeds don't clot as quickly in this population,” said Dr. Thomas. National Institute on Alcohol Abuse and Alcoholism. Alcohol-related Emergency Department Visits and Hospitalizations and their Co-Occurring Drug-Related, Mental Health, and Injury Conditions in the United States: Findings from the 2006-2010 Nationwide Emergency Department Sample (NEDS) and Nationwide Inpatient Sample (NIS). September 2013. Retrieved online on June 20, 2014.